Here we are in late June, about halfway through the 2012 season, which has been an ordinary year characterized by extraordinary occurrences. Looking at the league as a whole: storied teams have done well, lowly teams have done badly, and a few dark-horses have stormed into the highlight reels. Already, five no-hitters have been thrown including two perfect games, as pitching continues to dominate the league. But nothing has been quite as interesting to follow as the transition of power in the National League East. Pitching is a decisive factor. That can be evidenced in no greater fashion than by the current standing of teams in the NL East. The Washington Nationals reside at the top of the division, relying on their pitching staff, the strongest in the league, to win games. The staff as a whole has the lowest ERA in the league–by a landslide. Their 2.98 mark is the only sub-three earned run average in the MLB. Second best are the Dodgers, who allow 3.30 earned runs per nine innings. The Nats also have the third most strikeouts in the MLB, and boast the lowest average against while allowing the fewest home runs. There is not even comprable company for Washington’s staff this season. And so far, all has been going well for the team, who leads by 3.5 games in the NL East. Despite their .242 team batting average, which ranks 23rd in the MLB, and overall poor offense, the Nats have taken the bull by its horns and have not been bumped from first place this month. What is concerning to me about Washington, though, is that they have been sub-par against elite teams. 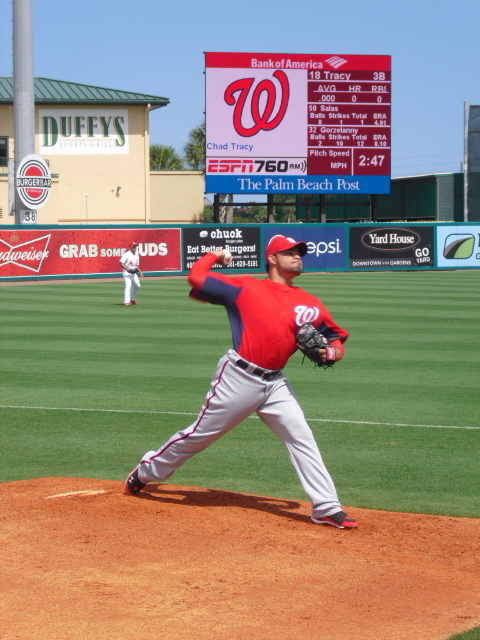 With regards to other first place squads, the Nationals were swept in three games by both the Dodgers and the Yankees, potential playoff match-ups for D.C.. Also, the team went 2-4 in the Beltway Series this year against a Baltimore team currently in second place in the American League. Atlanta and New York have hovered in the middle of the division for the first three months this year, but neither have had breakout streaks. In a similar manner to Washington, New York has been propelled by its pitching. Johan Santana tossed the first ever Mets no-hitter earlier this month, and R.A. Dickey has been the hottest pitcher in the majors as of late. Just this week did his string of 44 2/3 scoreless innings come to an end. From 1991 to 2005, the Braves won 14 consecutive division titles, but since then Atlanta has not regained its NL East dominance, and has only been to the playoffs once (in 2010 as a wild card). Powered by Jason Heyward and Dan Uggla, the Braves’ offense is potent, and ready to do some damage in the league, so look for them down the stretch to see if they can reverse 2011’s September collapse. Sitting at the cellar of the division are the Philadelphia Phillies and the Miami Marlins. I have avoided writing analytical and recap posts of the Marlins this month because it kills me to reflect on the June collapse. Now that it has happened two years in a row, I’m thinking that interleague play might be a factor that contributes to the team’s demise after May. But that just doesn’t make sense, unless the entire team fails mentally against AL clubs. This week, the seeming apex of Miami’s woes was reached as Heath Bell blew a not-even-save opportunity as Ozzie Guillen watched on. With a 6-2 lead going into the ninth inning, all Bell needed to do was get three outs before St. Louis scored four runs on Monday night. He couldn’t do it. 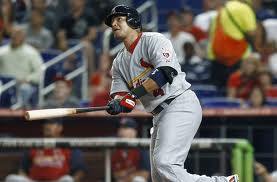 Yadier Molina capped the comeback with a two run bomb to tie up the game well after Bell should have closed it out. And sure, the chunky closer was able to end the half inning right after that by inducing a ground out. Ozzie Guillen, as was previously stated, watched the entire thing without executing his managerial powers. When Bell had trouble closing out games earlier this year, Guillen used the excuse that Bell was the closer and he needed to get used to it, to justify his action of not bringing in a new arm. But this time it was unbelievable. It does not matter what Bell is supposed to be, right now, he cannot perform as a closer should; therefore, he should not be the closer. Philadelphia, however, has been at or near the bottom of the division this entire year, they haven’t taken a joyride up and down it like Miami has. Seemingly, the Phillies should improve as their studs return from injury. Superstars Ryan Howard and Chase Utley have been out the whole year, and their returns are imminent. The NL East division standings remained sturdy through the first three months of this 2012 season. As long as the Nationals “age quod agis” (do what you are doing), they should finish strong and wrap up the title. The Braves and Mets both have hope because this year, the MLB is introducing a second wild card team into the playoffs. The two wild cards will square off before the rest of the postseason gets underway. If things hold up, it looks like the NL East may have completed baseball’s version of the demographic transition as just last year the Phillies were at the top, and two years ago the Nats were at the bottom. Exciting times are awaiting after the All-Star break. I really can’t say I’m surprised by the Nationals’ success. As a person who saw them in my fair share of games in-person last year, I knew they were going to be a very good team without any additions. Add on Gio Gonzalez, Bryce Harper, and others to that equation, of course they’re going to be a dynamite team. Well I’ve followed the Nats since 2008, when they moved into the new park, and it was clear they were improving every year. The season they had last year was impressive, but I thought they were still about a year or two of development away from being THIS good. Harper and Strasburg have exceeded reasonable expectations, so they do deserve it.